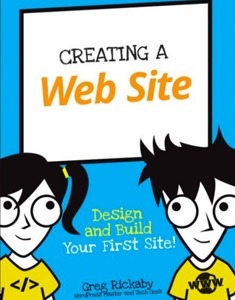 Creating a Web Site is the kids’ guide to learning basic website design! From planning to perfecting, this book walks you through the entire process of building your own website, with easy-to-read instructions and plenty of pictures every step of the way. Good planning saves you a ton of work, so you’ll begin by getting your ideas out of your head and onto paper. Next, you’ll find a template that already has the basic features you want, so you can start working on the fun stuff right away. You’ll learn all the HTML and CSS you need to make your site look and act the way you want it to, and you’ll learn how to add video, images, widgets, and more to make the design your very own! Before you know it, you’ll have your own custom-built website showcasing your talents and interests for the world. This book is part of the ‘Dummies Junior‘ initiative, a new series extension from the trusted For Dummies brand that is created to appeal to and educate younger readers. The series applies the core For Dummies approach of presenting complicated topics in a light-hearted and non-intimidating way.